Daniel was looking for the perfect engagement ring for Ann Marie. 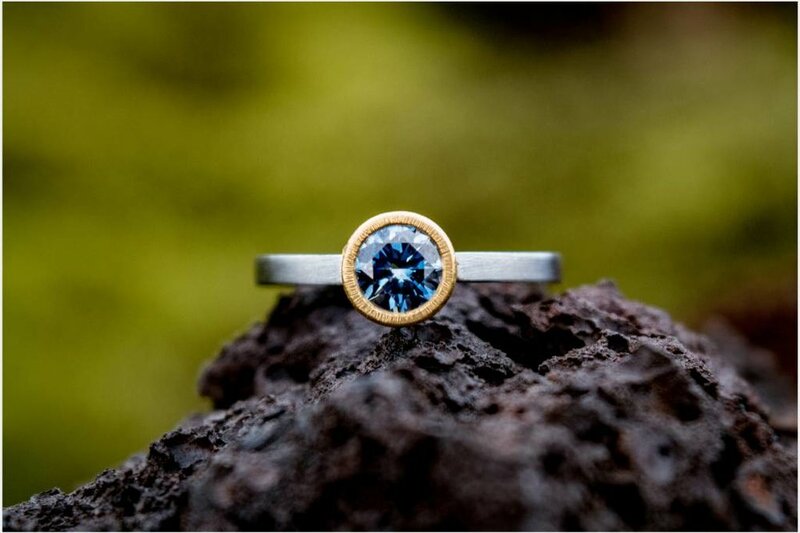 After google searching for custom designs and sustainably sourced materials, he found the kara | daniel website, and an ideal setting for the gemstone he had sourced. Daniel sourced a gorgeous vivid blue diamond for Ann Marie. He chose a lab-created diamond for ethical reasons and wanted a jeweler and setting that would be an ethical match. He chose our solitaire bezel-setting to highlight the diamond, while keeping a light and more delicate feel for the ring. The recycled 22k gold provided high contrast with the blue diamond, a plus for Ann Marie, who is a graphic designer. The proposal took place this fall in Iceland. The landscape was stunning, the ring looks at home against the natural background, and she said yes! Congratulations Daniel & Ann Marie!